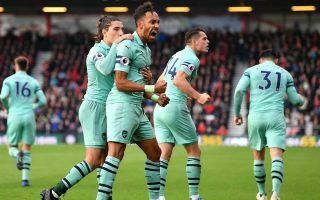 Arsenal striker Pierre-Emerick Aubameyang has been spotted liking an Instagram post regarding the club’s rumoured interest in the transfer of Ivan Perisic. The Inter Milan winger has been linked by Gianluca Di Marzio as being the subject of a £38million bid from the Gunners, and it seems Aubameyang would be keen on the potential addition. In fairness, Perisic seems ideally suited to the way Aubameyang and Alexandre Lacazette like to play up front, with the pair proving prolific for Arsenal but lacking much in the way of ammunition at times.